Concern over relations with the Arab and Muslim world and potential terror attacks against Brazil might lead to a reversal of the president’s pledge. In response to pressure, the office of Brazil’s President Jair Bolsonaro is considering the establishment of an “embassy branch” in Jerusalem instead of a full-fledged embassy, reported the Israel Hayom daily. According to the report, the pullback from the earlier pledge to move the embassy from Tel Aviv to Jerusalem is due to concerns that the move could result in terrorist attacks on the country and hurt Brazil’s export industry with Arab states. Bolsonaro announced in November, after winning the presidential election, that he intends to move his country’s embassy to Jerusalem. 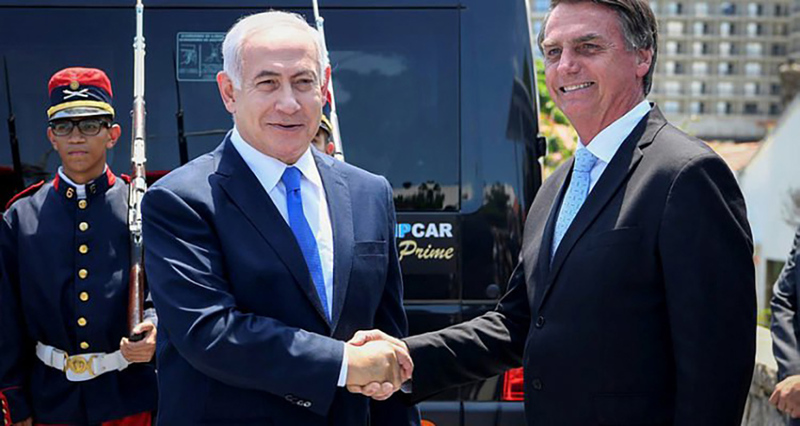 When Prime Minister Benjamin Netanyahu visited Brazil for Bolsonaro’s January 1 presidential inauguration, the Brazilian leader pledged that the move was only a matter of time. However, even before taking office, Bolsonaro was feeling the heat from the Arab world. In December, the Arab League warned Bolsonaro that moving Brazil’s embassy to Jerusalem would strain relations with Arab countries. Within Brazil, there has been pressure on the new president from advisers who belong to the “old guard” and from the military establishment, according to the newspaper report. Previous Brazilian governments have taken a strong pro-Palestinian stance. In 2016, the Palestinian Authority opened an embassy in Brasilia. The lower-grade mission that would be established in Jerusalem would be similar in status, according to the report, to the trade office set up by Hungary in the Israeli capital this past week. Almost all countries represented in Israel maintain their embassies in the Tel Aviv area. However, President Trump recognized Jerusalem as Israel’s capital in 2017 and set up the U.S. Embassy in Jerusalem in May 2018. Guatemala followed suit. In September, Paraguay reversed its embassy move to Jerusalem and returned it to Tel Aviv. “Paraguay wants to contribute to an intensification of regional diplomatic efforts to achieve a broad, fair, and lasting peace in the Middle East,” Foreign Minister Luis Alberto Castiglioni said at the time. For countries considering the move to Jerusalem, it has been a matter of balancing between the potential harm in relations with the Arab and Muslim world if the embassy is moved to Jerusalem and angering the U.S., which has been encouraging countries to make the move. Israel and Honduras have agreed to proceed with a plan to open embassies in Jerusalem and Tegucigalpa. The commitment was made in January in a joint statement on behalf of the two countries and the U.S.
Trump had threatened to cut off aid to Tegucigalpa over the issue of illegal migrants from Honduras crossing Mexico heading for the U.S. border. Honduras hoped that the agreement on setting up an embassy in Jerusalem would instead mean upgraded ties with the U.S. administration. The Brazilian president is scheduled to visit the U.S. and meet with Trump this week.